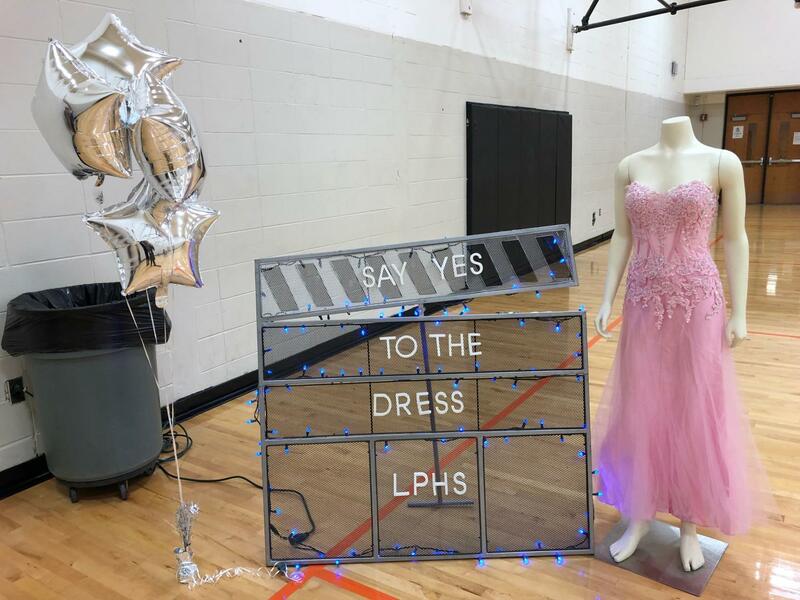 LPHS students are preparing to Say Yes to the Dress. Say Yes to the Dress is an event that gives all girls the opportunity to attend Prom wearing a beautiful dress that they love. The dresses do not cost anything to them, and any student at LPHS who is eligible to go to Prom may wear one. The first shopping day for students was on March 20th. Two more days are scheduled in April for girls to look at dresses: On April 8 from 4-6 p.m. girls will be able to have an after school shopping day with their parents in the PAC. Later, on April 10th, dresses will be available during all school lunches. “People spend hundreds of dollars on dresses, and we want to give girls an option to put their money somewhere without missing out on the chance to have a great dress,” Amy Jackson, VLA Coordinator and Say Yes to the Dress co-sponsor, said. Anyone is able to donate a dress by bringing it to the school and giving it to either Mrs. Jackson in B.11 or Mrs. Lebo in Art Room 1. The event coordinators are offering two GR points and five raffle tickets to a drawing for a “Prom basket” to any girl who donates a dress . Salon Rouge generously donated a “Prom Pampering” package for raffle winners; it includes hair styling, nails, and professional make-up. The focus this year has been on maximizing the impact the event has on students, while keeping it simple. New this year are two extra days of shopping: one during all lunches and one after school so families can join in on7 the fun. “I loved it. It was an amazing experience and I am very grateful. I think it’s amazing that the school is hosting this event for girls who don’t have the time or money to go buy a new dress, and I love the idea of the ‘Prom Pampering’ package,” Jordan Nelson, junior, said. LPHS has had tremendous help from those who have been giving this event publicity. Mr. Ruff and students made beautiful new dress racks this year, and Mrs. Lebo is helping to run the event. Everyone is working to make this event the best it can be, and there is no greater reward than seeing the smile of a girl’s who has found “the dress”.